Takeaway: Delamination in concrete slabs can be a serious problem, but there are a few key ways to prevent it. A concrete floor slab placed days ago has hardened and cured. As work from other trades continues in the area, someone drops a hammer from a ladder onto the floor, and an unexpected sound is heard. Instead of the clear ringing sound you would expect when metal hits solid concrete, a "drummy" sound or loud clack draws your attention. Using the hammer to tap around this spot, you identify more hollow-sounding areas. What's been discovered is a surface delamination in the concrete floor. Delamination is when a laminate or solid surface splits into horizontal layers. In the case of a concrete slab, the horizontal splitting, cracking or separation tends to occur near the upper surface, when the cement used to bond the aggregate together to create the concrete has delaminated, or separated. When fresh concrete is placed and compacted, the solids (cement and aggregate) settle. This natural settlement causes excess mixed water and entrapped air to be displaced (called bleeding), and the lighter materials migrate toward the surface. If finishing operations start prematurely and close or seal the surface before bleeding is completed, air and/or water are trapped under the densified surface mortar. As concrete hardens, subsurface voids develop where the water or air is trapped. These voids create weakened zones right below the surface that can eventually detach during slab use. Very thin mortar layers over delaminations may even detach when struck with a hammer, as you try to sound out the extent of the delaminated area. It is also often caused by the corrosion of reinforcing steel within the concrete. Delaminations come in various forms and degrees of severity. Blisters are small, isolated delaminations, usually 1 to 3 inches in diameter (Photo 1). Blisters frequently happen when relatively sticky mixes with higher percentages of fine aggregate are placed. They occur in areas subject to moderate to high rates of evaporation and that are finished too soon. When finishing operations occur too early and uniformly over the slab, delamination can be quite widespread and affect larger zones of a slab surface (Photos 2 and 3). Photo 2: Slab placed on waterproofing membrane on roof slab. Premature finishing resulted in widespread delamination. Photo 3: The thickness or depth of a delamination can vary, depending on the mix and the timing of final finishing. Here, the depth of delamination is about 1/8 to 1/4 inch. Photo 4: Postpone final finishing operations until the bleed water sheen has evaporated. The simplest way to prevent delamination is to start the final finishing of the slab after the bleeding process has run its course. But this may not be as easy as it sounds. Following consolidation, and once bleeding is complete, there is nothing left to be trapped to cause voids. However, a finisher's job to properly time final finishing can be an art because job-specific influences impact this timing on each project. Stickier mixes, thicker slabs, different types of sub-grades, initial concrete temperatures, different cementitious contents and changes in ambient temperatures all affect the bleeding process and impact when finishing should begin. At air contents greater than 3%, a dense, hard-troweled surface isn't necessary. There is less potential for delamination if you give the surface a light steel-troweled finish or a broom finish in exterior areas where slip resistance is a concern. When concrete is placed on an impervious sub-base, bleed water must rise to the top because it can't exit out of the slab bottom. Compared to slabs cast on a porous sub-base, the bleed water quantity will be greater and bleed time may be longer, especially in cold weather. Don't place concrete on cold sub-grades when ground temperatures are below 40°F. The cold ground slows the setting of the bottom part of the slab, making the timing of finishing even more difficult to judge. To reduce this differential set retardation, keep the sub-grade covered until the time of concrete placement. Do warm the concrete or use small doses of set accelerator to promote more a uniform setting of the mix. Do take special precautions when ambient evaporative conditions are high and exceed concrete bleeding rates. Under these conditions, it's tougher to judge when bleeding is complete. Here's a trick learned on the job site: Place a domed garbage can lid on the surface for a few minutes, and if you see bleed water after lifting the lid, bleeding is still in progress even if it's not easily visible over the entire slab. Do take measures to counteract rapid evaporative conditions on the job site, such as wind, low humidity and hot temperatures. Otherwise, crews are often forced to start final finishing of a surface before it gets away from them. The best ways to stop the surface from crusting and prevent high evaporation rates is to erect wind breaks, fog the air 5 feet above a slab (Photo 5), or spray on an evaporative retardant. If drummy-sounding areas on a slab are easily detectable by a hammer or chain dragging, the subsurface probably contains voids. Depending on their severity and slab use (such as exposure to wheel loads and heavy traffic), these zones are likely to detach sooner rather than later from a sound surface. To achieve a high-quality surface, remove the defective concrete to a depth where only sound concrete remains. 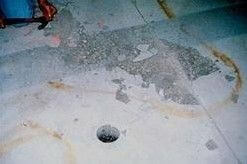 The proper removal of unsound concrete by suitable methods—such as shot-blasting (Photo 6), grinding or hydro-demolition—is critical if subsequent steps are to be successful. 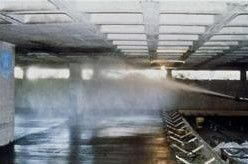 Photo 5: Fogging a slab surface increases relative humidity and decreases the rate of evaporation. Here the fog spray is 5 feet above the slab surface. Do not spray directly at the slab surface or finish the water into the slab. This commonly results in dusting. Photo 6: Removal of a delaminated slab surface by shot-blasting, after hammer sounding identified zones of drummy concrete. Shot-blasting may need to be followed by sandblasting to ensure the removal of all weakened concrete. After the proper removal of unsound concrete, you can then apply a new surface. In some cases, the slab can be ground smooth and sealed, resulting in an attractive final surface with an exposed-aggregate appearance. Alternately, you can bond a topping to the prepared roughened surface. You can find resurfacing products for both interior and exterior use that are formulated to bond to a sound substrate and provide an attractive, sound new working surface.